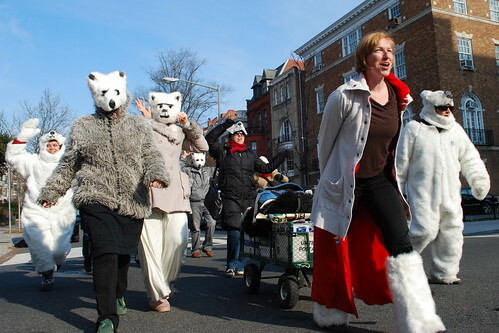 The Organic Consumers Association's Washington DC office, led by Alexis Baden-Mayer, participated in the Inauguration of Barack Hussein Obama, 44th President of the United States, by organizing a roving band of dancing polar bears. The Polar Bears Against War & Melting Ice (PAWMI) carted a mobile disco and distributed 6,000 free commemorative postcards and calendars to crowds that celebrated by dancing in the streets. We've got one chance here! to the solutions to war and pollution! Phase out coal & oil & gas! Reduce, and then, recycle and reuse! Conservation first, then renewable fuels! Money for health care not for war! Tax the rich to help the poor! Homes not jails, books not bars! Bikes not bombs, clean fuel cars! help the poor while we're helping the polar! 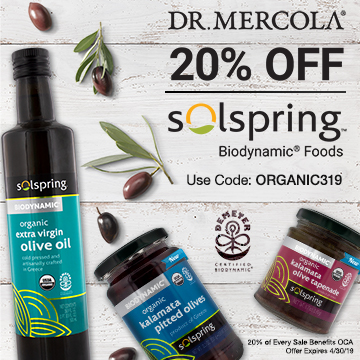 help the people while we're helping the planet! As vendors tried to hock t-shirts and buttons and informal parades erupted, a small pack of environmentalists with the Organic Consumers Association dressed up as polar bears and danced down the street with a boom box on wheels. Group member Alexis Baden-Mayer said that while her group was hopeful for Obama’s presidency, it was also critical of some of his policies and appointments, particularly that of his energy chief. The Obama Inauguration: Two Miles Away, It Was "Still Worth It to Be Here"
Global warming was protested by dancers in polar bear costumes. Today’s inauguration turned into an interspecies celebration for Polar Bears Against War and Melting Ice, a Washington advocacy group. Starting at 10 a.m., two group members stood at the corner of 14 Street and New York Avenue, dressed in homemade polar bear suits, and commemorated the event by dancing and leading a conga line to Barack Obama-themed music blasting from an iPod and speakers powered by two DuraLast batteries typically used for cars and trucks. “We are very concerned about Barack Obama’s policy towards coal. There’s no clean coal; we need to focus on solar and wind energy. But we’re here to congratulate him,” said organizer and D.C. resident Adam Eidinger, 35. Eidinger, who has lived in the capital for 16 years, has seen his share of inaugurations; for the last two he organized protests. Since October 2007, the group has usually used the suits, fashioned from fake fur and papier-mché, for protest.